Crystal Palace has signed Mamadou Sakho for the rest of the season after the defender fell out of favor at Liverpool. The France center back has made 80 appearances for Liverpool since joining from Paris Saint-Germain in September 2013, but he hasn't appeared on the pitch once this season. Sakho hasn't played since April, first while serving a provisional ban for a failed drug test — a case later dismissed by UEFA — and then after being sent home from the preseason tour of the United States because of concerns over his attitude. Relegation-threatened Palace also signed defensive midfielder Luka Milivojevic from Greek side Olympiakos on deadline day. Spain's second-division club Rayo Vallecano says it signed Ukraine striker Roman Zozulya on a loan from Real Betis despite protests by many of its supporters on social media because of his alleged connections to radical groups back home, something he quickly dismissed with an open letter to fans. Zozulya says the misunderstanding happened when he arrived in Spain last year to play for Betis wearing a shirt that a local journalist thought displayed a badge supporting radical groups in his native country. He said the journalist later admitted the mistake and apologized. The 27-year-old striker says he supported the army back home to "help protect" his country, but reiterates that he is not linked nor supports "paramilitary or neo-Nazi groups." Zozulya who was in Ukraine's squad at the European Championship in France last year. Swansea has signed striker Jordan Ayew from Aston Villa and defender Neil Taylor has moved in the opposite direction. Ayew, on Ghana duty at the African Cup of Nations in Gabon, has signed a contract until 2020. Ayew ends an 18-month stay at second-tier side Villa having scored 10 goals in 58 games. His brother Andre played for Swansea before making a move to West Ham last year. Paul Clement says Ayew is "versatile and dynamic to attack the lines and get in behind defenses. He will certainly give us something different to what we've got." Spanish club Granada says Ghana midfielder Wakaso Mubarak will join the team on loan from Panathinaikos after the African Cup of Nations. Granada will have an option to buy the 26-year-old player after the loan period ends in June. He previously played for Spanish clubs Elche, Villarreal, Espanyol and Las Palmas, with a total of 63 matches in the Spanish league. League Cup finalist Southampton has signed forward Manolo Gabbiadini from Napoli. The 25 year-old Gabbiadini signed a deal through June 2021 with the south-coast Premier League club. Gabbiadini, who has also played for Atalanta, Bologna and Sampdoria, has scored 58 goals in 215 appearances for Italian clubs. He also has played six times for Italy's national team, scoring once. Gabbiadini says "since I was a kid, one of my dreams was to perform in one of the biggest leagues in the world, so now that it's happening I can't wait to start playing." 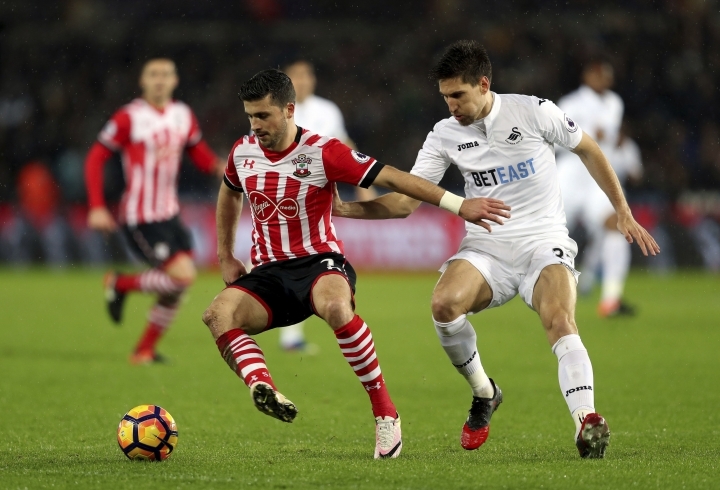 Southampton's executive director of football, Les Reed, says "Manolo is another exciting addition to our attacking line-up ahead of the final months of the season, as well as for future campaigns." French league leader Monaco is sending Nigerian left back Elderson to Spanish club Sporting Gijon on loan until the end of the season. Sporting, currently in the relegation zone in the Spanish league, says the 29-year-old player is expected to arrive in Spain on Wednesday to undergo a medial can sign the contract. Valencia is signing Chile forward Fabian Orellana on a loan from Celta Vigo until the end of the season, with an option to buy the player and give him a contract until June 2019. Orellana has made 39 appearances for Chile's national team and helped his nation win the Copa America Centenario last year. He also previously played for Granada and has 163 appearances in the Spanish league, scoring 21 goals and providing 28 assists. Valencia, which is six points from relegation zone in the league, had already signed Italy striker Simone Zaza on loan from Juventus until the end of the season. The Los Angeles Galaxy has signed French winger Romain Alessandrini from Marseille. No further details of the contract were given by the Major League Soccer club. The 27-year-old Alessandrini was in his third season with Marseille, but failed to hold down a regular place last season and started only three league games during the current campaign. The arrival of France international Dimitri Payet from West Ham meant he would invariably get less playing time. A quick and skillful winger with an eye for goal, Alessandrini can play on both flanks. His best season was in 2012-13 when he scored 10 league goals in 22 games for former club Rennes before sustaining a serious knee injury. Ajax has signed Brazil youth international winger David Neres Campos from Sao Paulo for 12 million euros ($13 million). The 19-year-old Neres will join the Amsterdam club after the South American under-20 championships in Ecuador. His signing came just hours after Ajax sold winger Anwar El Ghazi to French club Lille. Marc Overmars, the former Ajax winger now in charge of the club's player policy, calls Neres "one of the biggest talents in South America. It's great he's chosen Ajax." Neres is a right winger who also can play on the left flank. Ajax says the transfer fee can rise to 15 million euros "depending on variables..."
Ajax is currently second in the Eredivisie, five points behind archrival Feyenoord. Saint-Etienne has signed winger Jorginho from Portuguese first division club Arouca on loan until the end of the season with an option to buy him. The 21-year-old Jorginho, who is Portuguese, can play on either flank and scored five league goals for Arouca this season. Jorginho joined Arouca from Manchester City last season. His arrival in France comes after Saint-Etienne scrapped a six-month loan deal for Frenchman Anthony Mounier. Mounier arrived from Serie A club Bologna last week. But the Saint-Etienne fans forced him out because of a video he made a few years ago when playing for Nice, and where he made offensive comments about Saint-Etienne fans. Odion Ighalo is swapping the Premier League for the Chinese Super League after leaving Watford for Changchun Yatai. The striker scored 39 times in 100 games for Watford and helped the team return to the top-flight in 2015. But the goals dried up this season, with the Nigerian only netting twice in 20 appearances. Ighalo was allowed to leave after Watford signed AC Milan striker M'Baye Niang on loan and forward Mauro Zarate from Fiorentina. Slavia Prague has agreed a transfer of its 22-year-old midfielder Antonin Barak to Udinese in Serie A after the season. Slavia chief executive Jaroslav Tvrdik says the transfer day was set for July 1 and Slavia will receive for the about $3.2 million - 10 times more than Slavia paid provincial Czech club Pribram for the player in December 2015. Tvrdik says the clubs are expected to finalize the details shortly. Barak scored a goal in his only international appearance for the Czech Republic. Paris Saint-Germain has loaned goalkeeper Salvatore Sirigu to Spanish club Osasuna until the end of the season. The French champion said that Osasuna does not have an option to buy Sirigu, who has another season to run on his PSG contract. The 30-year-old Sirigu, who has 17 caps for Italy, was already on loan to Spanish side Sevilla — but made only two league appearances. He was PSG's first choice for four seasons before losing his place to German Kevin Trapp last season. He arrives with Osasuna in second-to-last-place in the Spanish league and enduring a 12-game winless streak. The promoted club also reached a deal for the return of defender Nikola Vujadinovic until the end of the season after a stint in Chinese football. Real Madrid says defensive midfielder Lucas Silva will play on loan in Brazil with former club Cruzeiro until June 2018. After helping Cruzeiro win two straight Brazilian league titles in 2013-14, Silva transferred to Madrid for a reported fee of nearly 15 million euros ($16 million). He played sporadically before being sent on loan to French club Marseille last season. Another loan to Sporting Lisbon fell through because of a heart condition detected in a medical last year. Further tests ruled out any serious problem that could keep the 23-year-old from continuing to play. He had been training with Madrid, but was expected to be loaned to another club. Premier League club Southampton has signed goalkeeper Mouez Hassen on loan from Nice until the end of the season. Nice said that Southampton does not have the option to buy the 21-year-old Hassen, who will team up with his former coach Claude Puel on England's south coast. Puel gave Hassen his debut for Nice at the age of 18 and he became a regular during the 2014-15 season. Although he made 14 league appearances last season, Hassen was then replaced as first choice by Yoann Cardinale. The squad reshuffle at Premier League club Hull under recently appointed coach Marco Silva continued with defender Alex Bruce and striker James Weir allowed to leave for second-tier Wigan on loan. Silva has seen key midfielders Robert Snodgrass and Jake Livermore depart this month, while defenders Omar Elabdellaoui and Andrea Ranocchia, winger Lazar Markovic, playmaker Evandro and striker Oumar Niasse are new arrivals for a team lying next to last in the standings. On a low-key deadline day so far in the Premier League, central midfielder Ashley Westwood joined Burnley from Aston Villa for an undisclosed fee, and Crystal Palace sent midfielder Jordon Mutch on loan to Reading in the second tier. Southampton signed goalkeeper Mouez Hassen on a five-month loan deal from French club Nice. Second-division Spanish club Tenerife says it has signed Gaku Shibasaki, the Japanese midfielder who scored both goals for Kashima Antlers in the extra-time loss to Real Madrid in the Club World Cup final in December. Tenerife says the 24-year-old offensive midfielder arrives with a contract until the end of the season. Shibasaki won the Bronze Ball award as Kashima became the first Asian club to reach a Club World Cup final. He played the last six seasons with Kashima Antlers. Tenerife is in sixth place in Spain's second division. The top three teams will be promoted next season. Spanish club Malaga says it has reached a deal to sign 22-year-old midfielder Jose Rodriguez on loan from German team Mainz until the end of the season. Rodriguez was part of Real Madrid's youth squads and played some matches in the first team under coach Jose Mourinho in the 2012-13 season. He played on loan with Deportivo La Coruna before transferring to Galatasaray in Turkey and eventually making it to Mainz. Malaga says it has an option to buy the midfielder, who has been a member of Spain's youth squads. Celta Vigo says it will sign 22-year-old Danish playmaker Andrew Hjulsager from Brondby. Celta says the deal with the "versatile midfielder" is pending a medical. Hjulsager played 19 games with Brondby in the Danish league this season, scoring seven goals. He has been a regular in Denmark's youth squads. No other contract details were immediately released. Valencia says it has reached a deal to send Australian reserve goalkeeper Mathew Ryan on loan to Belgian club Genk until the end of the season. The 24-year-old goalkeeper used to play for Club Brugge in Belgium before moving to Valencia in 2015. Valencia's starting goalkeeper is Diego Alves. Paris Saint-Germain is sending Spanish forward Jese Rodriguez to Las Palmas on loan until June. The Spanish club says "the player's wishes prevailed over other Italian and English teams who were prepared to pay the high costs" of Rodriguez's wages. Rodriguez, who transferred from Real Madrid to PSG for 25 million euros last summer, is from the Canary Islands, where Las Palmas is based. The 23-year-old forward did not play much under PSG coach Unay Emery, and he and the club looked for a loan deal. Rodriguez was mostly a reserve in Madrid's squad that won Champions League titles in 2014 and 2016. Las Palmas also says it added 20-year-old Croatian midfielder Alen Halilovic on a loan from German club Hamburg. Halilovic, who has played for Croatia, was signed by Barcelona from Dinamo Zagreb in 2014 for 2.2 million euros and transferred to Hamburg for 5 million euros last summer, with the Spanish club keeping a buyback option worth 10 million euros valid for two years. He was on loan to Sporting Gijon before moving to Germany. Hull has signed Italy defender Andrea Ranocchia on loan from Inter Milan, which has brought in Australia international Trent Sainsbury as a replacement, also on a temporary deal. The 25-year-old Sainsbury joins from Jiangsu Suning, which is owned by the same company which controls Inter. Inter is fourth in Serie A and in the quarterfinals of the Italian Cup. Ranocchia made just five league appearances this season, and says he could not resist the lure of the English Premier League. The 28-year-old Ranocchia says in Hull, "It wasn't a difficult decision to come here because I know this team plays in the best league in the world." Ranocchia could make his Hull debut on Wednesday at Manchester United. It has been a fast start to the final day of the transfer window for the northern club, which made the announcement just hours after recruiting Dutch striker Anwar El Ghazi. The 23-year-old Alonso has nine international caps, and joins from Paraguayan club Cerro Porteno. French league club Lille has made its first signing of the January transfer window, bringing in Dutch striker Anwar El Ghazi on a 4½-year deal on deadline day. The powerful El Ghazi, who can either play in a lone striker's role or wide, joined from Ajax. Financial details of the deal were not disclosed but sports daily L'Equipe said El Ghazi was bought for 7 million euros ($7.4 million). Lille has been struggling in attack, scoring only 21 goals in 22 league games, and made El Ghazi a priority. The club is 11th in the league standings, 23 points behind leader Monaco. El Ghazi says "my goal is to fight for the club, goals will come later." Bayer Leverkusen has signed Jamaican forward Leon Bailey from Belgian club Genk. The Bundesliga side says the highly rated 19-year-old Bailey signed through 2022. Leverkusen sporting director Rudi Voeller says "this lad was also high on many other European clubs' wish list. That's why we're even happier that we could see off such strong competition." Bailey is eligible for Leverkusen's Champions League campaign despite playing in the Europa League for Genk this season. Bailey, who will be given the No. 9 jersey at Leverkusen, says, "Leverkusen is known for it, that you can develop well here. And the way football is played here is attractive. I like it." Clubs in European soccer's leading leagues have their final chance to sign players for the remainder of the season. The January transfer window closes at 1700 GMT in Germany, 2200 GMT in Italy and 2300 GMT in France, Spain and England. In the Premier League, final negotiations over transfers are set to be taking place while games are being played as 14 teams are in action on Tuesday evening.